Before setting out on my trip round the world I had made a promise to the Rev. Andrew Mearns, Secretary of the London Congregational Union, that I would undertake three months' evangelistic work in the Metropolis. Accordingly, on the 17th of December, 1895, Mr. B.F. Byrom, who was then fixing my engagements, accompanied me to London to settle the final arrangements with Mr. Mearns. When we entered the Memorial Hall on the morning of the 18th, Mr. Mearns handed me a telegram. I opened it and read these words: "Mrs. Smith seriously ill. Come home at once." When I left my wife the night before she seemed to be in good health, busy making preparations for a happy Christmas with us all at home together. I returned to Manchester at once. She had been seized with dreadful haemorrhages, which, beginning at ten o'clock on the night of the 17th, had continued at intervals till eleven o'clock on the evening of the 18th. The doctors, on leaving me at three o'clock in the morning of the 19th, said that she was practically a corpse - that it was simply impossible for her to live. When they returned next morning and saw how greatly improved she was they said, "This is a resurrection." The prayers offered for her and for me by hundreds of Christians all over the country had been answered. Slowly but surely she regained her health, though it was five or six months before she was quite well again. My work for Mr. Mearns in London called me away from my wife early in January. I am not skilled in the formation of diplomatic circumlocutions, and therefore I must say frankly that I do not look back upon this work in London with any real satisfaction. I was sent to several churches which were practically deserted. Indeed, my work was mostly among weak causes - in a few instances causes without a pastor or any organised band of workers. And most of the missions were only for a week. It took one quite a week to make oneself felt in these localities, and just when one was beginning to get a good hold of the people one had to leave and go elsewhere. Good was done, I am sure, and in every case before the week was finished we had crowded congregations. But it was surely unwise to send me to chapels which were without pastors, because there was no one to look after any converts that God gave us. In this campaign I worked at ten or eleven places. The right plan would have been the selection of six or seven of the strongest Churches and a fortnight's mission in each. In a live Church, with a capable minister and a competent band of workers, something great might have been accomplished. To send a missioner to some deserted, disorganised chapel, situated perhaps in a godless wilderness, and then expect valuable results in a week, is like sending a man to gather apples in the Sahara desert. "Oh, Dr. McLaren, I can never conduct a mission in your church. I can never stand in your pulpit." "Nonsense!" said Dr. McLaren, in his characteristically emphatic and decisive manner. "You must. I won't listen to that sort of thing. Keep these dates clear until I consult my office-bearers." I felt I must give in. There was no withstanding Dr. McLaren. I knew him, trusted him, loved him. He had won my heart years ago, and he had allowed me to call him my friend. I knew that the invitation was given only after much prayer and thought. Dr. McLaren is not a man to settle anything hastily or precipitately. I feel it is impossible for me to make my readers understand how terrible was the responsibility this invitation imposed upon me. I was deeply exercised in my spirit on account of my unworthiness. My testing-time came in the afternoon. I had had a sore conflict with the Evil One throughout the whole of the preceding week. The tempter whispered: "Your methods will never do for Union Chapel. Do you know that that is the most brainy and the most cultured congregation in England? These people have listened to the prince of preachers for many years. They have never had a mission such as you propose to conduct in their church. They do not understand it. Don't you try your methods there. They will not have them. If you insist on the methods that you adopt in other places the people will not come and listen to you. You will have the church to yourself." This struggle with Satan was very real. My heart and mind were sore distressed, but God gave me the victory. As I proceeded from the vestry into the church, I paused for a moment on the first step of the pulpit stairs and said to God: "Oh, my Lord, Thou hast given me all I am and all I have. Thou hast set Thine approval on my poor, weak methods. I place myself and my methods in Thy hands. In this church I will be true to what I believe Thou has been pleased to use." Throughout this mission I adopted my ordinary style of discourse and of dealing with people, and I never heard one sound of disapproval. The whole Church was with me. The last Sunday was a crowning triumph. So great were the throngs that the roads were blocked, and even the trains were brought to a standstill. The conductors were shouting: "This way for Dr. McLaren and Gipsy Smith." Alister McLaren went out to pacify the people, who were becoming somewhat tumultuous. He lost his hat, and was himself unable to get into church. A remarkable scene took place at the closing service on Monday night. Turning to Mr. Roberts, the co-pastor, who sat beside me, I said: "I am going to close now." "Wait a minute," he said, "there are others who ought to come out." I asked the people to be seated, and then said: "I know some of you are saying something like this to yourselves, "I owe all I am to Dr. McLaren - all that I possess of mental grasp and spiritual desire. He is my pastor. I have grown up under him. Is it quite fair to him that when I settle the most momentous question of my life I should do it at the invitation of a stranger? Is it loyal to my pastor?" I respect that feeling. I want you to be loyal to Dr. McLaren. But will you remember for one moment at whose invitation I am here? It was Dr. McLaren who brought me here. He was anxious about you. That was why he asked me to come and help him to beseech you in Christ's stead to be reconciled unto God. I do not think anything would gladden Dr. McLaren's heart more than to learn that in this mission, which he arranged for you, the desire of his heart had been accomplished. He is ill. You know it. Do you think that anything could be a greater joy and comfort to him than the receipt of a telegram saying that you had at last intelligently and honestly given yourself to Jesus Christ?" In less than five minutes fifty of the brightest and best young people in the congregation walked into the inquiry-room. So ended, as far as I was concerned, one of the most remarkable missions of my life. I have always felt that this campaign in Dr. McLaren's church set the hall-mark upon me as an evangelist. I have needed no further recommendation to many ministers than that I have had a mission at Union Chapel. As a consequence I have reached hundreds of people who from ignorance have had no sympathy with evangelistic methods. The mere fact that I have worked with Dr. McLaren has induced them in the first place to come and hear me, and afterwards, in many cases, to take their place amongst my closest friends. Anyhow, the workers determined to do their best. Gipsy Smith had been asked by the advice of Dr. McLaren, and they worked earnestly and prayerfully to make the mission an apt instrument for God's Spirit to use. Never was a mission prepared for more faithfully or more willingly. The services were advertised thoroughly. Largely attended prayer-meetings preceded the mission. And then came the opening night. At once it was seen that the mission would be a great success. Crowds flocked to the chapel. The gipsy preached and sang with persuasive power and pathos. From the first a considerable number entered the inquiry-rooms. Here was a large staff of specially selected and trained workers. But they were fully occupied, dealing with the numbers who were seeking salvation. It is impossible to say how many of the five hundred persons who passed through the inquiry rooms have stood the test of time. They came from every church and chapel in the neighbourhood. In our own church we reaped large results. Many of the converts were gathered into classes, where they were further instructed in the principles of Church membership. None were proposed for membership until three months had passed. Then great numbers were added to the Church, of whom the large proportion have continued steadfastly in the Church doctrine and breaking of bread, and prayer. 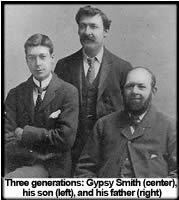 Some of our best workers to-day were converted under Gipsy Smith. Our missioner left delightful memories in our midst. He became a dear friend to many. His subsequent usefulness in an ever-widening sphere has given us great joy, but no surprise. He is ever a welcome visitor at our services. And he seldom comes to any service without being gripped by the hands of several whom Christ found during the mission through his agency. We love him, and we thank God for him, and we pray God to bless him yet more abundantly." During this year I began to receive invitations for mission work from Free Church Councils. At Bilston, upon the invitation of the local Council, I conducted a ten days' campaign at the Wesleyan Church, the church in which Dr. Berry afterwards died. I am told that the doctor whose funeral the great preacher was attending dated his decision for Christ from my mission in Wolverhampton. But this is anticipating. My host at Bilston, Mr. Bussey, was a very excellent man. Of his nine children, seven passed through the inquiry-room. The eldest son is now a local preacher in Bilston, and conducts missions with blessed results. Among the other converts was the organist. I had an amusing experience at Swansea. At the beginning of my career as an evangelist a young Welshman taught me a verse of a Welsh hymn. At one of my Swansea meetings, making the most of my knowledge of Welsh, I sang this verse. It was the only verse I knew. But, when I had started the people at hymn-singing, I could not stop them. My Welsh accent must have been good, because I was asked by some zealous patriots if I would preach in Welsh. "No," I said, reflectively, "I think I prefer English." "Great crowds have gathered to hear the Gipsy preach and sing. All who have been associated with him bear grateful testimony to his marvellous success. His remarkable personality contributes not a little to this result. There is a romance associated with his name and history. His gift of song also adds greatly to the charm and fascination. In private the Gipsy has the mien and bearing of a Christian gentleman, and those who have had him sojourning with them can best give their testimony as to his meekness and modesty, as also to the geniality and true manliness of his character. He is regarded with the greatest respect and affection by all who have come to know him intimately, and has made himself a universal favourite in the family circle. There are multitudes among us to whom Mr. Smith's visit this winter will be ever memorable as the beginning of days to them, and many more to whom his bright, hearty, happy Christian spirit has strikingly commended his Gospel message, and conveyed the marked and unmistakable impression of a true evangelist endued with rare spiritual power. On New Year's Day Mr. Smith is to sail for New York, and many friends will follow him with genuine sympathy and earnest prayer during a lengthened evangelistic tour in America. He may rest assured that a very cordial welcome awaits him whenever he shall again visit Edinburgh." I heard the Rev. Andrew Murray, the well known South African, at the Synod Hall, Edinburgh. At his meetings I made my first acquaintance with a hymn which I have often since used with great effect - "Moment by moment." I stayed, during part of my visit, with the Rev. Thomas Crerar, whose wife is the sister of Professor Henry Drummund, and I became very friendly with their little baby girl. She was just learning to speak, and called me "Gippo." She spoke of sugar as "lulu." She would tap the sideboard door with her little hands and say, "Lulu, lulu." But neither her parents nor her nurse would let her have any. However, she completely overcame me, and when we two were alone, I used to give my little sweetheart a small piece of "lulu." Some weeks after my departure from Edinburgh, I sent Mr. Crerar a photograph of myself. When baby saw it, she clapped her fat, chubby, little hands, screaming with delight, " Gippo, lulu, lulu!" "You rascal!" wrote Mr. Crerar to me. " We have found you out." When I first visited Edinburgh and stayed with Rev. George D. Low, M.A., his youngest boy, a little fellow in kilts, was taught to pray, "God bless Gipsy Smith." He was still a small boy and in the same garb when I returned, and in the meanwhile he had kept up that simple prayer. He had become fired with ambition as a preacher, and was accustomed to hold forth in his nursery. My little friend prepared his sermons regularly on Friday. The maids and his mother formed his usual Sunday evening congregation. He stood on a table with a clothes-horse, covered with a white sheet, in front of him. Only his little head was to be seen peeping out above this pulpit. The collections at the door of the nursery were for my Gipsy Waggon Mission. On the occasion of my second visit he had a meeting on the Saturday - a soirée. There was a large attendance. The little minister said in a stern, solemn tone: "I notice that when I have a soirée, I can get my church filled; but you do not come to the preaching on Sunday." His text on the 'Sunday evening was "It is I. Be not afraid," and a beautiful little sermon he preached. He said that "when Jesus comes to us it is not to frighten us, it is to take away the frightening, and it is to bring to us a sort of feeling that makes us feel sure, sure." The closing meeting of this Edinburgh campaign was for ministers, workers, and inquirers, and was held in Free St. George's (Dr. Whyte's). There was an overflowing congregation, at least two-thirds of which consisted of young converts. Rev. Dr. Macphail, of Pilrig, a noble specimen of a Highland Christian gentleman, was in the chair.